The earliest Australian colonies used the currency of other countries for many years and this persisted until the nineteenth century. Gold coins were some of the first to be made and consisted of sovereigns and half-sovereigns. These coins match those made in British mints but have small identifying markers. A more Australian identity was given to some produced between the 1850s and 1870s, these were minted in Adelaide and feature a wreath and ‘Australia.’ There is a strong collector’s market for Australian and Australian themed special edition gold and silver proof coins at auction. 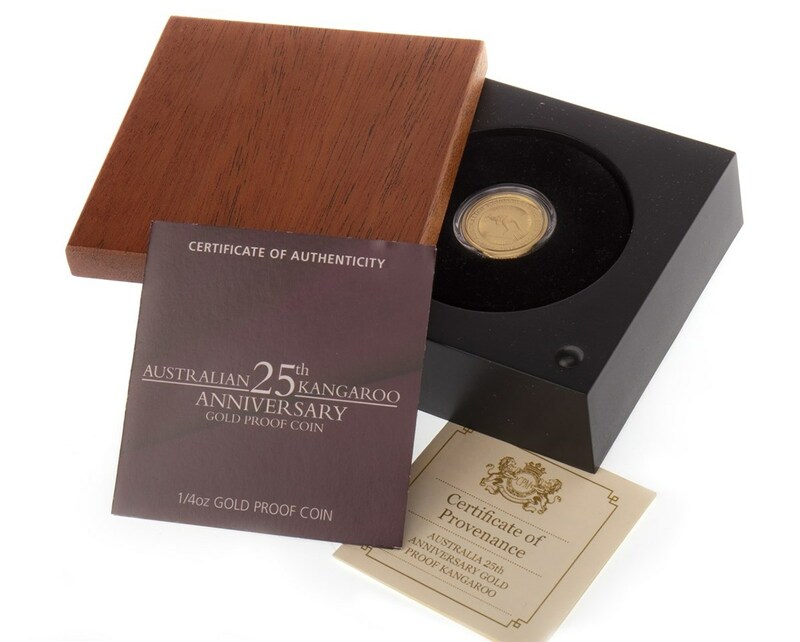 In the Coins Auction on 6 November lot 528 is an Australian Kangaroo 25th Anniversary Gold Proof Coin, estimated at £80-120. There are also two Australian gold sovereigns at lot 538 and 541, both are estimated at £150–200. Do you have coins or banknotes to sell? Contact sarah@mctears.co.uk for a free valuation or come along to the Valuation Days at McTear’s on Tuesday, Wednesday and Thursday this week for complimentary auction advice.